Scottsdale, Ariz. — At 8:55 Monday morning,Barry Bonds arrived in the hallway of Scottsdale Stadium and ducked into the coaches’ locker room. A few minutes later – after clubhouse manager Mike Murphy took away one pair of pants and replaced them with a smaller pair – Bonds emerged in a Giants uniform. For the first time since the last day of the 2007 season. Is this the first step in an attempt to rehabilitate an image tarnished by a steroids scandal, a felony conviction and a career’s worth of nastiness? Such as his prolonged legal battle. Bonds was found guilty of one count of obstruction of justice, lost an appeal, paid a fine, served 30 days of house arrest and – while he continues an appeal to have the charge erased from his record – has mostly resolved his issues. Now he would like to get back into baseball’s good graces. Monday felt like turn-back-the-clock day at Giants camp. There was Bonds in orange and black. There were throngs of media members lining the hall, a rope serving as a barricade, Pedro Gomez and his ESPN camera set up on the field. But, in significant ways, things were different. Bonds arrived without a posse. He was much skinnier than the last time he was in uniform. Media members were tweeting, something that was in its infancy when Bonds was playing and a sign of just how long ago that was. And the young, loose Giants clubhouse is a vastly different place from the one that Bonds ruled. Bonds was different, too. A few months shy of his 50th birthday, he put on the charm. Answered questions with a smile. Laughed easily. The former surly persona, one that Bonds described as simply a “character” he donned while playing, was absent. Bonds is in camp for one week as a special hitting instructor. Nobody on the Giants side, or Bonds himself, was willing to look any further. “I don’t even know if I’m good at it,” Bonds said. But in the six seasons that have elapsed since he left the game, Bonds has been tarnished as the headliner of the steroids era. He has seen Mark McGwire and Roger Clemens – two other former superstars who have been under intense scrutiny – get coaching jobs. Former Giants third baseman Matt Williams, who was named in the Mitchell Report on performance-enhancing drugs, is now a manager. If their images can be rehabilitated, why not Bonds’? 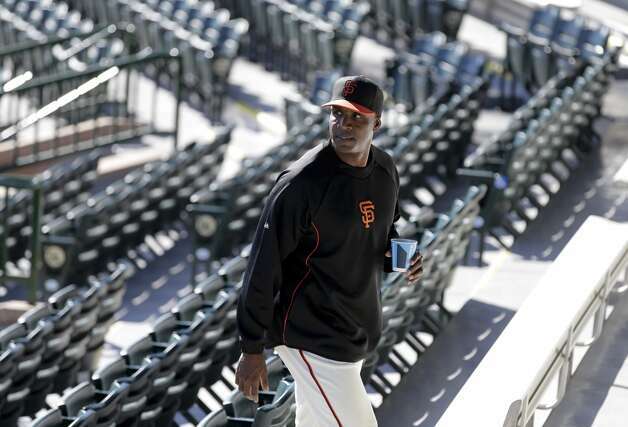 Bonds was asked if he would admit to using steroids, as McGwire tearfully did in 2010. “I already went to court, and that’s where I’ll leave it,” said Bonds, whose legal team has probably advised him not to admit to anything. The Hall of Fame might be his endgame, though he didn’t overtly lobby. Bonds has always been his own entity, governed by different rules. While it might be tempting to note a racial imbalance between the men who have been welcomed back to baseball and those on the outside, the truth is Bonds simply never had many advocates or friends in the game. That, awkwardly, was on display Monday. Bonds addressed his manager as “Bochy” time and again, making one wonder if he even remembered that the man’s first name is Bruce. When asked what he missed about the game, Bonds didn’t respond the way 99.9 percent of all former athletes do, by saying “the guys” or “the camaraderie.” Instead, Bonds cited workouts and routine. Which was probably wise, because any reminiscing about old pals and fun times would have rung false. It’s hard to even describe how different the Giants are now from what they were then. One young staff member asked me if it had really changed, a question that could only come from an employee who had never been belittled or yelled at by Bonds. Tim Lincecum was a 23-year-old rookie who came up in May 2007, Bonds’ final year. The big-league atmosphere was overwhelming, and Bonds was “like the cherry on top,” Lincecum said. He noted how different it is now. Without Bonds, the Giants did something they couldn’t do with him: win a World Series. And then another. Bonds, who has recently moved from Los Angeles to San Francisco, said there was nothing bittersweet in those victories. Bonds claimed to have just one regret about the past. “I wish that we all had a better relationship,” he told the media. The transformation from self-absorbed superstar to friendlier and more accessible human is a common one among athletes. Aside from the tangible goals of the Hall of Fame, a job in baseball and an improved image, Bonds might simply not know what to do with himself. But the next seven days are set. He’s a baseball savant. He has an ability and the Giants are tapping into it. For now.